Seems like just yesterday Prince Fielder and Ryan Braun were bashing their way to 30-homer seasons, doesnÃ¢â‚¬â„¢t it? (ItÃ¢â‚¬â„¢s crazy to think Fielder last played for Milwaukee in the 2011 season.) In any case, in 2015 the Brewers were an undistinguished offensive team; of the 15 National League squads, the Brewers ranked eighth in base running, ninth in isolated power, 12th in adjusted runs created, and 13th in fWAR. And with sturdy offensive players like Khris Davis, Carlos Gomez, and Adam Lind exiting from the 2015 team, consistent offense will be a problem in Milwaukee. Bernie Brewer may need to turn to alternative means of exercise this summer; IÃ¢â‚¬â„¢m not sure there will be enough post-Brewer home run slides to burn off all that bratwurst. The Brewers werenÃ¢â‚¬â„¢t much better defensively in 2015, ranking 12th in the NL in Ultimate Zone Rating, 12th in Defensive Runs Saved, and 14th in fielding percentage. Of MilwaukeeÃ¢â‚¬â„¢s projected starting eight, itÃ¢â‚¬â„¢s possible that only three players will be manning those same positions on Opening Day 2017, and Braun is the lone player on the roster with a concrete salary in place after the 2017 season. The reality for the Brewers is that, much like the Reds, they are playing for the future, and that involves waiting for players to develop. In the meantime, Brewers fans will have to tolerate the likes of Chris Carter, Aaron Hill, and Kirk Nieuwenhuis. Last year, Lucroy broke his left big toe in April and suffered a concussion in September. The two maladies limited one of the gameÃ¢â‚¬â„¢s better catchers to 103 games in 2015 and thwarted LucroyÃ¢â‚¬â„¢s typically-sterling digits at the dish. Lucroy, who is tearing the cover off the ball in spring training, seems to be healthy again, and he wonÃ¢â‚¬â„¢t turn 30 until June, so there is no immediate worry about too much age-related decline. A healthy Lucroy led the Brewers in fWAR in 2014; heÃ¢â‚¬â„¢s a good bet to do the same in 2016. A strong defensive catcher (6 Defensive Runs Saved in 2015), Maldonado experienced atypical playing time in 2015 while filling in for the injured Lucroy and slashed .201/.282/.293 in 79 games. Again, MaldonadoÃ¢â‚¬â„¢s value is tied his defense, as he was an above replacement-level player in 2015 (0.2 fWAR) despite his inadequate bat. On Opening Day 2015, the Brewers started Adam Lind at first, Gennett at second, Jean Segura at shortstop, and Aramis Ramirez at third. Ramirez (now retired) was moved to the Pirates in July, Lind was traded to the Mariners in December, and Segura was shipped to the Diamondbacks in January. Ramirez, Lind, and Segura have accumulated 50.5 fWAR over their careers. Carter, Villar, and Hill have combined for 22.1 fWAR. ThatÃ¢â‚¬â„¢s rebuilding for you. At first base, Carter brings big-time stature (6-4, 245 pounds) and power (90 home runs from 2013-15). Unfortunately, the considerable thunder Carter packs comes with a monstrous caveat: Carter has struck out more often any other major leaguer over the past three seasons. He also owns a career average of .217 and has totalled minus-14 Defensive Runs Saved at first base for his career. Gennett, slated to be the everyday guy at second base, profiles as more of a bench player than a regular due to his light bat; for his career Gennett is slashing .287/.318/.381 with mediocre run creation numbers (99 career wrC+) and weak plate discipline (career walk rate of four percent, career strikeout rate of 16.2 percent). Acquired from the Astros in November for minor league pitcher Cy Sneed, Villar is the Brew CrewÃ¢â‚¬â„¢s new shortstop — at least until top prospect Orlando Arcia inevitably takes over. Villar, 24, flashed substantial improvement in 2015 with Houston, seeing his BABIP (.360) and on-base percentage (.339) skyrocket 89 and 72 points, respectively, from their 2014 marks. VillarÃ¢â‚¬â„¢s contact rates soared across the board in 2015, but expectations in 2016 should be dulledÃ‚Â by VillarÃ¢â‚¬â„¢s 27.4 career strikeout rate and his defensive shortcomings at shortstop (minus-6 career DRS). Hill was extremely productive in 2008 with the Blue Jays (4.0 fWAR), and with the Diamondbacks from 2011-12 (6.8 fWAR). Since then, the 34-year-old has declined precipitously, racking up park-adjusted run creation totals (wRC+) of 78 and 71 (100 is league average) in 133 games in 2014 and 116 contests in 2015, respectively. Hill has spent most of his career playing second base, but he is penciled in to start at the hot corner in spite of supar (minus-4 DRS) defensive numbers at third. In spite of a very underwhelming bat (.244/.289/.349 career minor league slash), Rivera is slated to be VillarÃ¢â‚¬â„¢s backup at shortstop. The 23-year-old — who can also play second and third base — certainly looks like he can sure pick it at short, though. Walsh, 26, came over from the Athletics in the December Rule 5 draft. Walsh, who has never played in the majors and was originally drafted by the Cardinals, is slashing .256/.400/.333 through Sunday’sÃ‚Â spring games. WalshÃ¢â‚¬â„¢s Joey Votto-esque on-base percentage is no fluke; in 2,452 career minor league plate appearances, WalshÃ¢â‚¬â„¢s on-base percentage is .395, including a .447 mark at Double-A Midland in 2015. WalshÃ¢â‚¬â„¢s primary position over the last few years has become second base, but he does have experience at both third base and in left field. Walsh seems like a cinch to make the team at this point — Walsh must stick on the 25-man roster all season or be returned to the Athletics — but locating regular playing time could be difficult. After a ho-hum 2014 season (by his lofty standards), Braun rebounded well in 2015. The 32-year-old Braun — itÃ¢â‚¬â„¢s crazy to think 2016 will be BraunÃ¢â‚¬â„¢s 10th in the majors — regained some of his power last season. And while age-related decline will likely prevent Braun from reaching the 30-homer plateau again, he still remains an offensive force. Something to keep an eye on is BraunÃ¢â‚¬â„¢s surgically-repaired back: after going under the knife in October, Braun was brought along slowly to begin the spring. He had been progressing well until he woke up with back soreness last week. 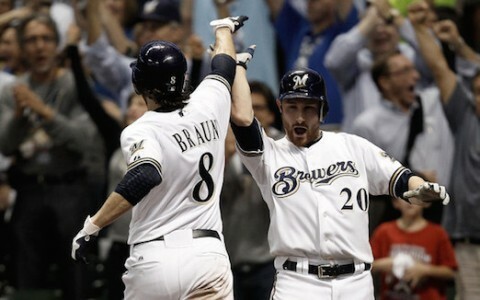 However, BrewersÃ¢â‚¬â„¢ manager Craig Counsell expects Braun to be ready for Opening Day, though. Braun, who is moving back to left field after spending 2014-15 in right field, is unlikely to find his way into any further stripping-down of MilwaukeeÃ¢â‚¬â„¢s roster, as he has five seasons and $96 million remaining on his contract. One of the stars of camp is Broxton, a 25-year-old near-journeyman who was drafted by the Diamondbacks in 2009 and was shipped to the Brewers from the Pirates in December. BroxtonÃ¢â‚¬â„¢s strikeout rates have vacillated between 25 and 35 percent in the minors, though it does seem he found his way a bit offensively at Double in 2014 (134 wRC+) and 2015 (137 wRC+) and at Triple-A last summer (126 wRC+). Broxton, who is known for his stellar defense in center field, has impressed at the plateÃ‚Â (.278/.422/.333) and on the base paths (six of eight on steals) this spring, too. He is the favorite to start in center on Opening Day. Santana, a former Astros prospect who came over in the Carlos Gomez-Mike Fiers swap, is about to acquire his first sustained taste of the big leagues. The burly outfielderÃ‚Â (6-5, 220) possessesÃ‚Â prodigious power, having clubbed 80 home runs across 426 games in HoustonÃ¢â‚¬â„¢s minor leagues from 2012-15. SantanaÃ¢â‚¬â„¢s power stroke comes with a typical drawback of a player of his ilk: he strikes out a ton. Santana has fanned at a 37.6 percent clip across 205 major league plate appearances to this point in his young career (Santana turns 24 in August), though that number does not stray too far from SantanaÃ¢â‚¬â„¢s minor league strikeout rates. Flores, acquiredÃ‚Â from the Mariners in NovemberÃ‚Â in exchange for infielder Luis Sardinas, has already been told that he’s made the Opening Day roster. Flores, who has slashed .275/.363/.405 across 2,922 minor league plate appearances and is out of minor league options, can play first base in addition to all three outfield positions. As his FanGraphsÃ¢â‚¬â„¢ profile says, NieuwenhuisÃ‚Â just mayÃ‚Â Ã¢â‚¬Å“stumble” into playing time with the Brewers. The 28-year-old former Met is a solid defensive center fielder, but sports a career strikeout rate (31.5 percent) that rivals CarterÃ¢â‚¬â„¢s. There is modern baseball player named Cy Sneed. I have to assume he’s a time traveler from the 1890s with a name like that. Hah! Nice! There is also a Boog Powell running around in the Rays system. Little Boog got traded this winter to Seattle. There is just something so not right with “little” and Boog Powell in the same paragraph nevermind sentence. Man, is that a throwback and a half. Baseball needs more Boog. Slightly unrelated…while reading this, I began to think about watchability (and how unwatchable I find guys like Chris Carter). I’m curious what other folks think. My goal was to make these players have a similar offensive value, just off the top of my head. Player A would have his entire offensive value derived from power hitting and having an average-ish walk rate. Player B would have his value equally derived from decent on-base skills/putting tons of balls in play and having plus-plus speed/baserunning. Good question. I’m going to say Player B would be more watchable to me because I think he would be less frustrating. I think it’s easier to say “this guy just doesn’t have the power to hit it over the fence” and accept Player B as a solid contributor. He doesn’t make a lot of outs, he has some gap power, he’s active on the bases, what’s not to like? Few HR’s but everybody can’t be Babe Ruth (is the attitude I think I would have). It would feel like he wasn’t living up to his full potential, and every strikeout would be a reminder. This is ugly for the Brew Crew. None of the players listed will be a significant impact player when the team again becomes competitive, with Braun probably being the lone holdover simply because of his contract, age, injuries and declining performance. Now this is a tear it all down type of re-build. 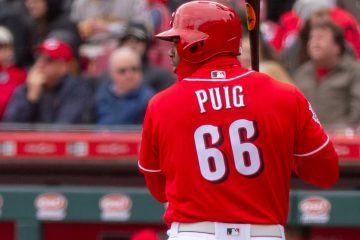 Glad the Reds chose another avenue to re-build/-re-boot. Crazy. Some people said the,Reds will come in last behind this terrible team. If that happens then we are in for a lot of bad seasons ahead. This team could lose 110. Yeah, I always thought it was a bit odd that some projections has the Crew ahead of the Redlegs. 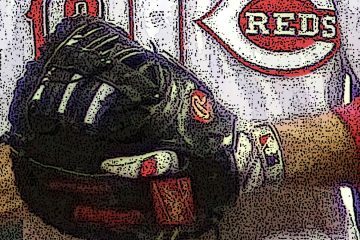 As you put, the Brewers seem terrible… even more so than the Reds could be. If any of the Reds young pitching pans out and Mesoraco/Bailey can return to somewhat decent form following injury, there’s no reason to think the Brewers could outpace the Reds. There’s a rather large gap in talent, I think, at the major league level. I feel a little better about Gennet than Grant does. A 99 wRC+ isn’t smashing by any means but works pretty well for a middle-infielder. The projections however don’t like him very much, thinking he’ll struggle to get to a 90 wRC+. I think he has more upside than that as he’s just shy of a whopping 26 years old. His walk-rate may hold him back though. It’s bad. His glove is about average. Born in Cincy though so I pull for him! There is a chance that Carter or Santana challenge the MLB record for most strikeouts if they get enough playing time. The Brewers fans have that to look forward too. Carter is already 3rd on that list.